Trailhead and parking lot are located on the south side of the Kancamagus Highway in Albany, NH, 10.6 miles west of Rt. 16 and 24.6 miles east of Rt. 93 at exit 32. Mt. 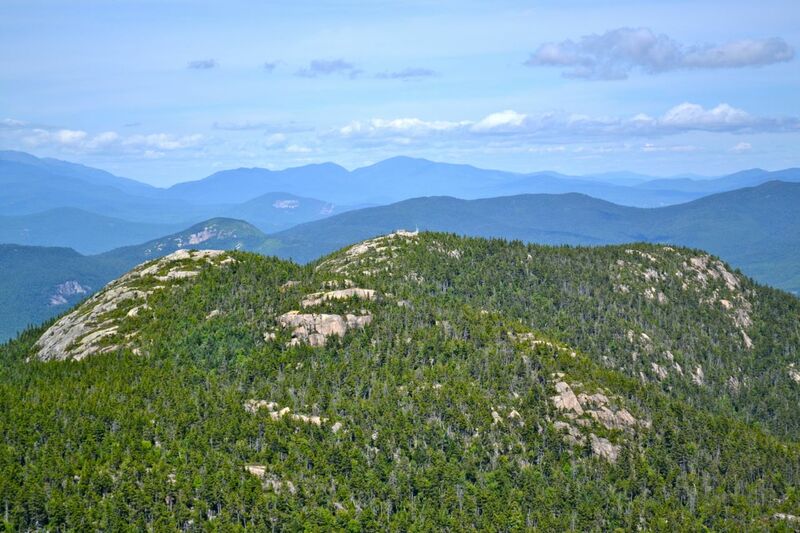 Chocorua, the easternmost mountain in the Sandwich Range, is the most recognizable peak in all of the White Mountains. Its pointed, rocky summit is also one of its more popular hiking destinations, and for good reason. Its vast view is one of the best for mountains of its size. The mountain has a variety of options for hiking; this route from the north passes two scenic waterfalls on its way. The Champney Falls Trail starts on the south side of the Kancamagus Highway. Immediately after beginning, the trail crosses Twin Brook, which originates on the north side of nearby Mt. Paugus, then reaches a junction. Bear left to stay on Champney Falls Trail as Bolles Trail goes right. After heading deeper into the woods, it meets Champney Brook and climbs slowly and steadily, staying close to the brook, to a fork, reached at 1.4 miles. Turn left and descend to Champney and Pitcher Falls (more information on their separate page) in 0.2 miles. Climb 0.1 miles over a rocky section to rejoin the main trail. The trail continues upward at a steeper grade for 0.7 miles before switchbacks begin. There are several restricted views along the switchbacks. After 0.6 miles in the switchbacks, pass Champney Falls Cutoff on the left. In another 0.2 miles, The trail plateaus in a ledgy area and passes the junction with Middle Sister Trail. Turn right and continue a shore distance to the trail's end at Piper Trail. Stay straight and follow Piper Trail as it descends past a view ahead to the summit. In 0.2 miles, pass West Side Trail on the right and soon emerge on open rock. Follow the blazes carefully as the trail works its way up and around the sharp summit cone. This is the most difficult part of the entire hike; much rock scrambling is required. Just before turning left to make the final approach to the summit, Liberty Trail enters from ahead. To the west, the Sandwich Range continues toward Waterville Valley. Nearest to you is Mt. Paugus. Beyond are Mts. Whiteface and Passaconaway. To the left and behind Whiteface is Sandwich Dome, while to the right and behind Passaconaway are the Tripyramids. Further back and to the right of the Tripyramids is Mt. Osceola, with Mt. Kancamagus to the right of that. In the far distance, seen at the end of the valley of the Kancamagus Highway are the Kinsmans and the Franconia Range. To the northwest are Mts. Hancock and Carrigain, with much lower Green's Cliff in front. Across deep Carrigain Notch and behind bumpy Mt. Tremont in the Nancy Range, with the Willey Range being and to the right. Across Crawford Notch, the ridge of the Southern Presidentials, seen above nearby Bear Mountain, rises all the way to Mt. Washington. Below Washington is the Montalban Ridge. Directly to the north are the ledgy Three Sisters, which you will visit later in the hike. Above is Big Attitash Mountain, and in the distance is the Carter-Moriah Range. Just to the right is Moat Mountain, with many distant mountains in the Wild River and Conway areas beyond. To the east is the flat expanse of western Maine and several lakes in both states. To the southeast is Green Mountain, and to the south is the Ossipee Range. To the southwest, the view extends into the Lakes Region. For a side trip with an excellent view back at Chocorua, return the way you came all the way back to the junction with Middle Sister Trail. Instead of turning left, bear right and follow this trail 0.3 miles to the summit of First Sister. Continue 0.1 miles past the summit to a junction with Champney Falls Cutoff. For more views and to see the remains of an old fire lookout, continue straight for 0.1 miles to Middle Sister. To return follow Champney Falls Cutoff 0.3 miles back to Champney Falls Trail.